Did you know that you can choose to receive blog posts by email? I’ve written about this previously and described how this may have advantages for end users who either do not have access to RSS readers (e.g. they are not provided on an institutional desktop) or prefer the familiarity of their email client. 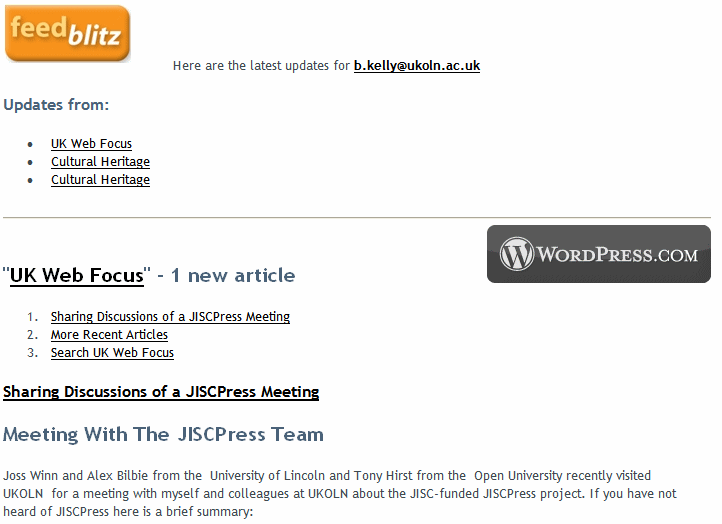 An example of how blog posts are displayed in an email client is shown below. This illustrates that the service (in this case Feedblitz) included embedded images together with a tables of contents, providing internal links to both multiple articles and section headings in a blog post. The reason I’m revisiting this subject is in response to recent discussions on Twitter and several library-related mailing lists regarding the excessive posts to such lists made by Gerry McKieran. Gerry is a prolific blogger and clearly has a real passion about his interest. Unfortunately Gerry fails to appreciate that many mailing lists have been established to support community interests and multiple posts from an individual can hinder the effective workings of such lists. Such problems are compounded when the person posting (a) fails to engage in discussions on the lists and (b) duplicates the posts on other lists. Despite a heartfelt plea from Davey Patten on the LIS-Web2 list which has been echoed by others on various lists, in a post entitled “The Universe Is Not Flat >>> Let The Conversations Continue >>>” Gerry points out (apparently without irony) that “in most online communities, 90% of users are lurkers who never contribute, 9% of users contribute a little, and 1% of users account for almost all the action“. Therefore he asks, in his own inimitable style, “Please Don’t Diss Me For Being Actively Engaged >>> Or Because I Have Broad Interests“. Which Email Service To Use? Although end users may wish to make their own decision as to which email subscription service to use, in reality, I think, blog owners will need to make it easy for their readers to subscribe to posts by email. But which service to use? I have provided two option in this side bar for this blog: WordPress’s subscription service and the service provided by Feedburner. I added the link to the WordPress subscription service recently as I wondered if this would provide any additional benefits. In my administrator’s interface I can see that there seems to be 26 active subscribers who receive blog posts and 146 subscribers to comments on specific posts. However the Feedburner service (now owned by Google) does seem provide more information. There are currently 91 subscribers to the service and the numbers have grown particularly since the blog post describing the service was published. In light of this I intend to remote the link to the WordPress subscription service. I’ll also try to ensure that other blogs I contribute to provide a link to the Feedburner service – so that I won’t need to send posts my email! This entry was posted on 24 Aug 2010 at 8:45 am	and is filed under Web2.0. You can follow any responses to this entry through the RSS 2.0 feed. You can leave a response, or trackback from your own site. On a point of clarification – Gerry’s “Universe is flat” piece wasn’t *despite* Dave’s message – Dave’s brilliantly written message was in reply to that piece from Gerry (see the Previous by thread link on the jiscmail archive page). Which might indicate that he’s got the message? Yes, my wording gave the impression that Dave’s email was written before Gerry’s post. This wasn’t the case, as you point out. Sorry for the confusion. I’m using Feedburner for users to subscribe via email or RSS. Currently I have about 650 subscribed via RSS (some seem to be blogs and 100+ are friendfeeds actually so the 650 figure is inflated) and about 70 subscribed via email. The option to subscribe via email and RSS is prominently listed. A bit surprised by >10% email subscriptions, though I suspect some are subscribed via both RSS and email.